Distribution & Habitat: Ctenanthe burle-marxii is native to an area from southern Central America south to southeastern Brazil. 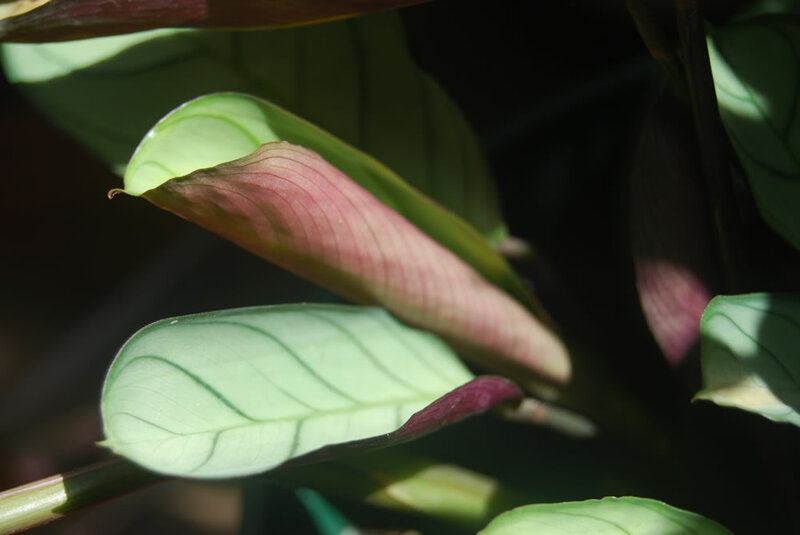 During the day this beautiful Ctenanthe plant displays its striking oval pale green leaves with dark green markings in all their glory and then when night falls it folds up it’s leaves displaying it’s deep purple undersides. Description: Ctenanthe burle-marxii is a species of evergreen perennial with soft hairy, purple tinge-green stems, 15cm (5.5 inch) long. 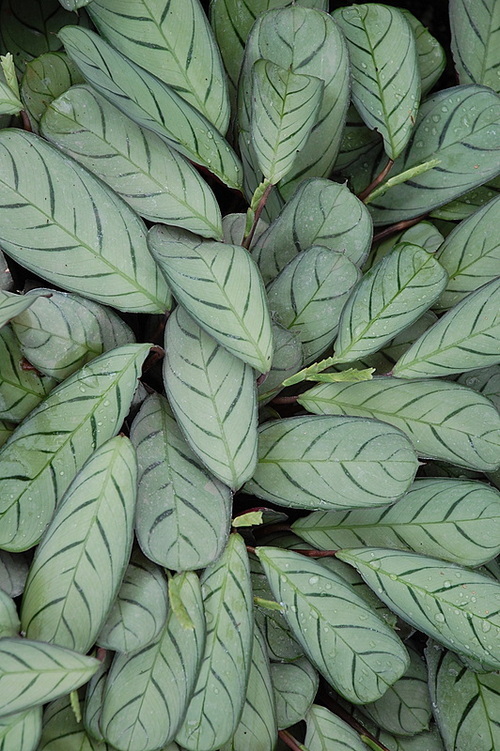 The striking ovate to oblong ovate leaves are hairless, have strong variegation of dark green with upward strokes of silvery-white. 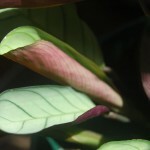 The underleaf has a strong burgundy colouring. Ctenanthe burle-marxii have sickle-shaped, dark green markings, prominent main veins and leaf bases of unequal sizes. The stem leaves are much larger than the basal leaves. White flowers are borne in inconspicuous spikes intermittently throughout the year. Ctenanthe burle-marxii is a low growing plant that grows to not much more than 30cm (12 inch) but gets wider and wider. Proper Care: Ctenanthe burle-marxii is normally fairly low maintenance and can thus be quite easy to grow – only a basic level of care is required throughout the year to ensure it thrives. Light: Ctenanthe burle-marxii do best throughout the year in bright filtered light (a translucent curtain is a useful filter). Direct sunlight can cause the leaves of these plants to curl up. Temperature: Normal room temperatures are generally suitable for Ctenanthe burle-marxii which cannot tolerate temperatures below 13oC. It is a good idea to stand the pots of Ctenanthe burle-marxii on trays or saucers of damp pebble to humidify the air around the plant. Watering: During the active growth period water moderately, enough to moisten the potting soil throughout and allow the top centimetre or so (0.5 inch) of the soil to dry out before watering again. During the midwinter rest period water much more sparingly, giving enough to keep the mixture from drying out completely. Fertiliser: Apply liquid fertiliser about every two weeks during the active growth period only. Potting and repotting: For Ctenanthe burle-marxii use an equal-parts combination of soil based potting mixture and leaf mould. Move Ctenanthe burle-marxii into pots one size bigger every spring until maximum convenient pot size has been reached – probably 15-20cm (6-8 inch). Propagation: In spring take a stem cutting with three or four leaves on it, making the cut immediately below a node. Dip the cut end in hormon rooting powder and plant it in 8cm (3 inch) pot of the mixture recommended for adult Ctenanthe burle-marxii; water the mixture enough to make it just moist. Enclose the whole in a plastic bag or propagation case and keep it warm in medium light. Rooting will occur in four to six weeks; after rotting treat the new plants as mature Ctenanthe burle-marxii. Propagation is also possible from basal offsets. Carefully detach an offset from the parent plant and place the offset in an 8cm (3 inch) pot of the recommended potting mixture. 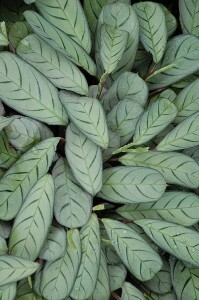 The new plant can be treated as a mature plant. Problems: Ctenanthe burle-marxii is generally disease free plant, but problem may occur when the right condition are not meet. Low humidity: If the leaves are turning brown and turn, the cause is low air humidity. Treatment: Increase the level of humidity by standing the plants on trays of moist pebbles and spray them. Pests: spider mite and mealy bug are the pests to look out for. The best way to prevent the pests is to keep the plant clean and dust free. Treatment: Treat the pests with commercial insecticide. Repeat the treatment every ten days for a month. Make sure that the plant is well watered during the treatment and do not expose it to sun when using sprays. Diseases: Botrytis, a fungal disease, can occur because of the high humidity these plants require. Prevent botrytis by quickly removing all dead or dying leaves and flowers that can serve as breeding grounds. Keep water off of the leaves and provide good air circulation around plant. Treatments: If the plant become infected, trim off the diseased areas, remove any soil that has mold on it and spray with a commercial fungicide. Uses: Ctenanthe burle-marxii is considered as the best indoor decorative purpose to add colors and attraction in desired area. It is suitable for group plants as well, offering an attractive tropical look. Ctenanthe burle-marxii are useful indoors, offices, terreriums and greenwalls. These plants would look great on the floor in a corner that needs that something but because they are only short they will suit a position on a low coffee table or a large table where to look down on them and capture their full beauty.